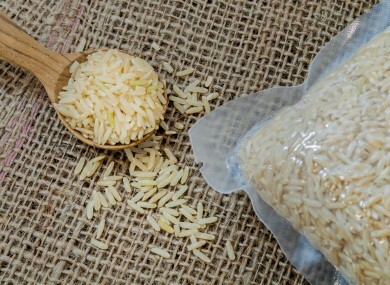 NIGERIA HAS SEIZED over 100 bags of plastic rice smuggled into the country, where prices of the staple food are rocketing ahead of the Christmas and New Year holidays. A suspect has been arrested over the haul of 102 bags of the fake rice, which officials warned this week was dangerous for human consumption. They are suspected to have been smuggled or illegally shipped in from China through Lagos port, a senior customs official in Nigeria’s commercial hub told AFP. The 50kg bags, branded ‘Best Tomato Rice’, had no date of manufacture and were intercepted on Monday in the Ikeja area of the sprawling city, the official said on condition of anonymity. We have done a preliminary analysis of the plastic rice. After boiling, it was sticky and only God knows what would have happened if people consumed it. Nigeria has banned rice imports as it seeks to boost local production. Haruna said the plastic rice was to be sold ahead of Christmas and New Year festivities, with the price for the popular Nigerian staple hitting the roof because of galloping inflation. A 50kg bag now sells for around 20,000 naira (around €60), more than double the price in December last year. Nigeria’s inflation stood at 18.5% in November, its 13th consecutive monthly rise, driven by higher food prices. The customs service has sent the fake rice to the National Agency for Food and Drug Administration and Control for further analysis. Email “People are selling 'rice' in Nigeria that is actually just coloured plastic”. Feedback on “People are selling 'rice' in Nigeria that is actually just coloured plastic”.